With some skilled planning, the first event outside Co Down was scheduled for the finest Spring day since records began! With beautiful blue skies and warm sunshine, Portstewart Strand will be fondly remembered for looking more like the Mediterranean than the North Coast and it helped create a fantastic atmosphere for a keenly contested race. The serene sound of the Atlantic lapping onto the golden sands would however soon be replaced by 100 hyper dogs and their equally excitable owners, some of whom had travelled over 100 miles to be there. Having learned from the Murlough experience that when the tide comes in, it goes back out again, the race was carefully scheduled to start at low tide, which would mean one thing – lots of beach and a MASS start! Or three big starts as turned out. The beach was split into two lanes, with the course a simple ‘there & back’ via #theroundabout at the barmouth end, a landmark structure that presumably could have been seen from space on race day. News of Waggy Races had spread like wildfire round the North Coast and the beautiful weather helped attract a big crowd. The sand was firm and compacted and in such perfect running conditions, it was clear that times would be rapid and records would be broken. At 12 o’clock, to a thunderous cheer, lots of dog noises and the pumping of the starter horn, the score of walkers set off at quite a canter. Among them, Torie Tenant and her lovely Guide dog Ushi were out for a PB, while injured Siobhan Owens (& Jack Russel Robin) were appearing in their 4th race. Tollymore veteran Samoyed, Lara (& owner Joanna) powered off alongside the likes of Andrea O’Donnell and her double dalmation team of Ruby and Cruz - the mix of breeds providing quite a spectacle! As the walkers disappeared towards Mussenden Temple, Personal trainer and four times Waggy Racer Claire Withers and embarrassed looking Beagle Cash took centre stage with the megaphone once again for a very barky warm up and dog massage session, which got our runners focussed and ready to rock. A few minutes later the countdown commenced, the hooter hooted, Buddy jumped, the lead camera vehicle revved and the PROs were off! This wave was not for the timid and the competition was hot as you scanned along the start line from ‘Team Kerr’ (& Max) in Lane 1 out to Karen Bleakley somewhere near the Atlantic. Former ladies podium topper Louise Smart (& Dexter) and Claire and Cash can never be ruled out, while a crowd of debutantes from the Springwell and Ballymena running clubs looked like forces to be reckoned with. The likes of locals Alison Rankin (& Paddy), Ursula Harper (Max) had home advantage, while Ballymena besties Kelly Courtney (& dalmation Daisy) and Paula McArthur (& Poppy) needed to be treated with an air of caution, as would Niamh Marrs with enthusiastic Husky, Sergei. In the mens, the wave one line up looked more like a ‘One Direction’ concert than a Waggy Races start line, with the likes of Brian McFarland (& Jet), Ivor Moody (Finn), Neill Harper (Oska), Robert Murray (Cody) and Harry McMahan (& Holly) in contention. Defending champ Gary Davison (& jumping collie Buddy) had earned the tag of pre-race favourite following a series of superfast parkruns, but previous podium placers Brendan O’Boyle (& shy collie, Dan) and Hawaiian immigrant Colin Jess (& bouncy Weimeraner, Axl) would have something to say about this. Rory Parsons had made a tactical last minute dog switch and is always there or thereabouts while Neal ‘the locomotive’ Lucas would form an edgy partnership with Zola, who he had met about 30 seconds before the race. Indeed, Zola and Neal would bond very quickly, the flame haired former sprinter scooping up two of her finest brown parcels inside the first km. On the Zola (Budd) note, bare footed runner Richard Harrington (and Jess) were back for their second outing alongside a spattering of pacy looking first timers entering the fray in the form of Ballymena runner Mark Alexander (& Poppy) and Chris Millar (& Logan). Wave 2 was a more casual affair but there were still rivalries right across the board. Bjorn (with Sophie) and Jenny (& Maya) were competing for supremacy in the O’Brien household, while Labrador Bo was hoping that owner Anne Cummings would be in peak condition after a day watching the 6 nations in the Harbour Bar. John Torrans and imposing athlete, Schnauzer Bart were competing for the 4th time, while our smallest ever Waggy racer, Bailey the Chihuahua was making his debut with Karen and Jason Currie. In a story of triumph over adversity, Sonya Doherty was making her debut with Staffie, Dixie. This was Sonya’s first time back at the Strand since a freak accident last year when a rogue wave washed her underneath her car, breaking numerous bones and seriously injuring her. Well done Sonya! Wave two had a lot more ‘teams’ (2 people/1 dog), so the battle for a podium place in this category would give an added edge of excitement. 1st lady home - Ciara Toner and little Lara! As the runners shrunk into the horizon, an excitable atmosphere developed as the gallery waited expectantly. To everyone’s surprise, a numberless man in bright yellow running attire with a collie came slowly jogging back and was first to cross the line. The crowd gasped and cheered until it became clear he was nothing to do with the race! 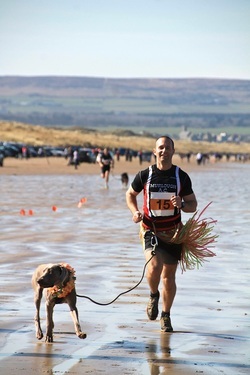 Just a few minutes later, everyone’s favourite Carrick Cannonball, Gary Davison, fresh from the Larne half marathon the previous day, came gliding up the beach with Buddy running on two legs beside him. This would be a Waggy Races record time (17mins 48 secs), well done Gary! Just over a minute later, Colin Jess and Axl crossed in their grass skirts to take silver and improve on their podium position at Murlough. A moment later Brendan O’Boyle and ‘Dan the man’ crossed to claim the final podium spot. On her debut outing, Ciara Toner with tiny Jack Russell cross, Lara, finished to claim top prize in an excellent time of 21mins, with fellow Springwell runner Alison Rankin and Springer Paddy not too far behind in 2nd. Louise Smart (& Dexter), finished 3rd to become the most decorated Waggy Racer in history, her fourth podium placing! In the 2-dog category, Aaron Hill, was first to finish (with Coco, Kizzy and more importantly, his car keys), while in the team race, a delighted looking Andrew Johnston and Adeline McCann (and Minnie) crossed hand in hand to take top spot. Second team home was Rachael & Nathan Duckett (with speedy Hungarian Viszla Jess), less than one minute later and bronze was taken by Sue Steen and Sharon Watty with Cocker Spaniel Milo! Well done teams! Once again and especially on such a glorious day, it was an absolute pleasure to watch all standards of runner and shapes and sizes of dogs as they ran, jogged, walked (and wheeled – well done Team Kerr in the soft sand – and winners of the ‘Spirit of Waggy Races award!!) over the finish line. Congratulations to everyone who finished the race and we hope you all enjoyed the day at the beach. In our 4th Waggy races, we had amazing conditions, a great crowd, a beautiful venue and it was clear that not even getting the car stuck that morning or having a sign washed away overnight was going to ruin race day...a day when Neil, despite his swarthy olive toned skin, got totally sunburnt (big red face in Harry’s Shack that evening). We handed out 12 snoods to people who were competing in their 4th race and with the move to a new area, it was fantastic to see so many new faces on the start line. All in all – two very happy organisers. As always, a huge thank you has to go to our sponsors and those who have helped with and supported our events – Waggy Races is indebted to you for your continued support. · Jollyes Pet Food Superstore again provided goody bags and prizes for the event, an essential part of race day! So thank you Gemma! · Murphy's Bark'ery must take a lot of credit for their stall, fantastic prize contributions, dinner plate cookies and for making the ‘business trip’ to the North Coast! · Dianna from Tidy Tails donated prize hampers. · Thanks also to Susan from Animal Artworks, whose animal portraits were on display at the race – Susan also donated two prize portraits to our winners, so we can’t wait to see Buddy and Lara on canvas! 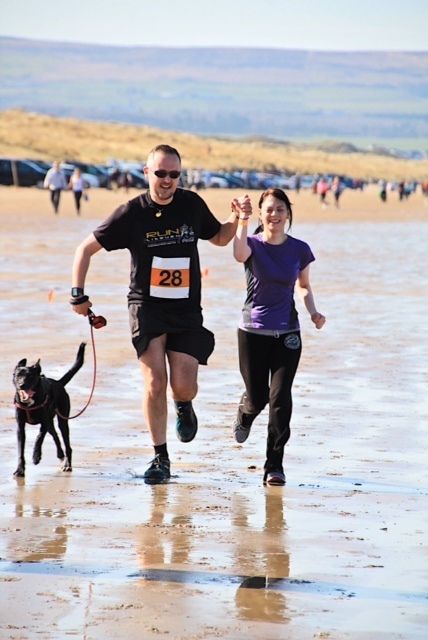 · Paul Carron Photography as usual produced brilliant pics of the action from around the course, while Sharon from Kalos Photography as always has captured race day beautifully – focusing on the human/dog interaction. · Anna Barron-Moore from Vets4Pets Lisburn (Longstone) made her veterinary debut (thankfully she did nothing but enjoy the sun!) and Dr Lynn Cromie provided medical support, race timing and constant reassurance! · The Guide Dogs NI team have also been great to work with and we thank you for coming to our events - thank you Becca and your team! · Thanks also to top marshals Steven Morisson and Ruth Black who were our lead vehicle videographers on the beach and who also marshalled the hugely impressive roundabout. Thanks guys!